Published recently – Joyce's mystery and fiction book reviews with some non-fiction too! I love this book! It is so sweet and caring and demonstrates empathy without being preachy. Daddy is sick and his daughter wants to make him feel better. 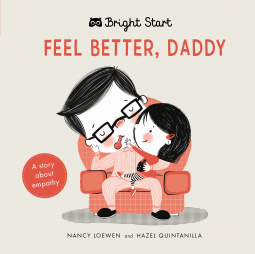 The child who listens to this picture book will see all that she tries…does daddy feel better in the end? Is he ready to be the usual daddy again? Adults may know but children will love finding out. The illustrations as you can see from the cover are simple yet very appealing. I enjoyed looking at the little girl, her dad and I adore the dog. There is a new series of books from Quarto called Bright Start. 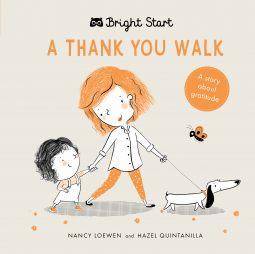 A Thank You Walk is the first of these that I have read; I think that the books will be welcomed by those with young children. A mom and her child go for a walk together. They observe the animals with whom they interact. The sounds that the animals make are their thank yous and the mom and child together enjoy hearing them, as for example, when a horse neighs after being given a carrot. The walk itself is also something that the child thanks her mom for. The illustrations are simple with black, white and a bit of color yet they are very engaging. The dog Duke in particular has a lot of personality. This is a sweet and simple story. It feels just right for the youngest children as it reminds them to be aware of the things that we may be thankful for and shows a warm relationship between a mother and child. Thanks to NetGalley and the publisher for this read in exchange for an honest review.